Delivering good competitive sailing and family fun. Launched by Istion Yachting Greece in 2010 the Catamarans Cup is an international regatta for cruising catamarans taking place each year at the end of October. 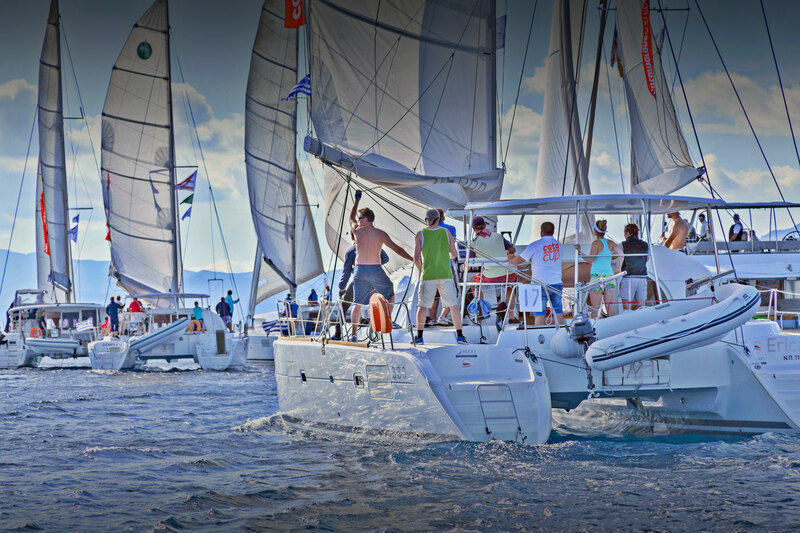 A unique event combining fun racing with a relaxing holiday week in the Greek islands, the regatta draws participants from over 18 countries who want to share with friends and family the experience of a sailing race in a safe and comfortable environment. Open to sailors of any level of competence, the Catamarans Cup is quite simply a whole lot of fun for all involved! For more details contact us, download the 2019 Catamarans Cup presentation (pdf) or check out the 2018 highlights on YouTube. For more information about Istion Yachting we invite you to visit our group sites including our main site istion.com, istionluxuryyachts.com for luxury crewed charters and yachthop.gr, our new site for day trips and hop on/hop off adventures in the Greek islands! Check photo galleries and Videos! We would like to thank all of our sponsors, supporters, providers and affiliated agents for their support! Fill the form and come with us!